The real-life account of an astounding quest—professor Tudor Parfitt's effort to recover the revered artifact that contained the Ten Commandments. This holy object disappeared from the Temple when the Babylonians invaded Jerusalem in 586 BC and was lost—apparently forever. With painstaking historical scholarship, groundbreaking genetic science, and fascinating on-the-ground discoveries, Parfitt debunks the previous myths and reveals the shocking history of the Ark and its keepers. From Israel to Egypt, Ethiopia, and the ruins of Great Zimbabwe, the journey leads to places Parfitt could never have imagined. He encounters a cannibalistic tribe in Papua New Guinea. Chapters include: The Cave; The Sign of His Kinship; Protocols of the Priests; The City of the Dead; A Key to the Past; Opposites Are One; Legends of the Queen of Sheba; The Tomb of Hud the Prophet of God; The Moses Gene; The Fire of God; The Sacred Fire Pot; Watchdogs of the King; The Dust of Its Hiding Place; more. Color photo section. Published at $14.99, now only $12.00! 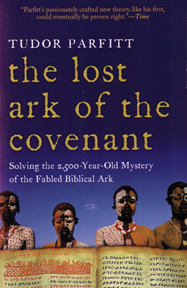 THE LOST ARK OF THE COVENANT: Solving the 2,500-Year-Old Mystery of the Fabled Biblical Ark By Tudor Parfitt. 380 Pages. 6x9 Paperback. Illustrated. Bibliography. Index.